What has Precinct Properties buying public land to do with hungry children in our schools? Anyone notice that 20-22% of schoolchildren in New Zealand are hungry every day? What has this to do with the recent sale by Auckland Council of the most valuable property in the country to a private company, Precinct Properties? Well, plenty. Let me explain. If Mayor Len Brown had played Monopoly enough as a kid he would know that the way to get rich is to buy properties. Well, read "buy land" actually. When a representative of Precinct Properties spoke on National radio tonight he was open when he said, “Our emphasis is on owning land freehold” Of course. “Freehold” means “free of rent”. How nice. So instead of leasing the land to a developer, the Auckland Council has sold 2 acres of the most valuable land in the country and thinks it has done a deal. But the "deal" is really Precinct Properties 100: Council 0. Precinct Properties knows it because they know the City Rail Link is about to start and the uplift in land value is theirs to capture – and other land owners near the hubs. It is not news that land near rapid transit hubs will rise in value. When the Jubilee Line Extension was built in London in the late 1990s, it was discovered that the uplift in land values of properties within 1000 m of a hub was £13 billion. The cost of the extension was a mere £3.5 billion. Yes, that means private landowners get windfall gains from public expenditure. The public loses all round and windfall gains are all privately collected by “freehold” land “owners”. Nice. Thanks! It's not a coincidence the sale happened right now. Auckland Council was busting to start the link but delays were frustrating them. Imagine the Precinct Properties smooth talk to gullible Mayor Len Brown: “If you let us buy the QE11 Square we will build a wonderful new building and attract huge expansion in Auckland. It will also enable you to start the City Rail Link.” "Wonderful," says Len. And he thinks: "Just what I want. People will remember me as the one who got the City Rail Link and did so much for the development of Auckland." Of course there will be development. 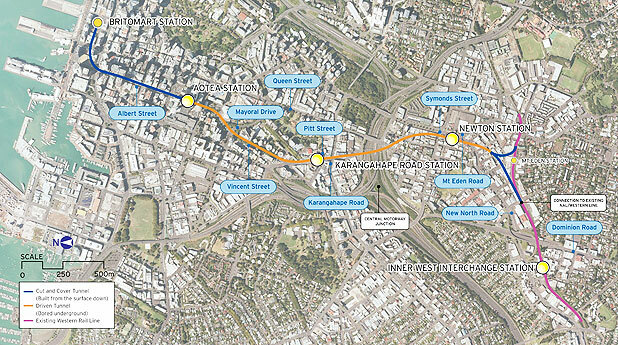 The start of the rail link is just what landowners near the City Rail Link hubs are hanging out for. Our party says we need more land in public ownership, not less. In fact there should be a law against selling public land. If the government or council want to have land utilised it should lease the land never sell it. OK, that is at the moment dreaming, as all the momentum is exactly in the other direction. But there is a partial and realistic solution – get land owners in the area to share part of their windfall gain with the council so the council can gradually pay off the loan to build the link. It can be done through targetted rates under the law. Targetted rates are used extensively by Wellington Regional Council and by almost every council. It is only a fraction of the windfall gains in land value that is targetted. And this is politically acceptable. People understand that they should share their gain with the public purse. If a landowner benefits from public spending they should pay higher rates. Spread over 20 years, it will pay a significant proportion of the cost of the City Rail Link. The Sydney Harbour Bridge and the Melbourne Rail Link were partially funded this way. The process is called Land Value Capture and it exists in various forms all over the world. So what has this got to do with hungry children? Remember the Campbell Live recently showed that of one class of 28 Year 11 students at Decile 2 Kelson Girls College, 18 of them didn’t have lunch and ten came to school with no breakfast. 8 had no breakfast and no lunch. “Many students are needy. Their parents are really struggling to make ends meet,” said the school principal. When people and businesses with the most valuable land (think central Auckland) have a windfall rise in land value, money that rightly belongs to the whole public flows into the coffers of the land “owners”. Businesses like Precinct Properties. The propaganda is that it is owned by mums and dads, yes very wealthy mums and dads, but mostly big investors like insurance companies and pension funds. Calculations earlier show that every year the public is deprived of something like $37 billion through the uplift in land values that occurs with development. A real estate agent last week told a friend in Howick that values there were rising by $15,000 a month and he could see no end to it. Yet the "mums and dads" of the Year 11 students at Kelston Girls College are paying rates or rents and often catching buses to work two jobs. Mostly they will be renting. They won’t be getting any unearned windfall from the uplift in land values. That is how people get rich, not by working. Wherever you find a really rich person or company you will know they are landowners who have received unearned gains from rising land values. My name is Deirdre Kent and I am the co-founder and co-leader of the New Economics Party New Zealand. We have been working for three years to try and design a new economic system which is going to work for all life on our planet and in our country. We have decided we need to bring together three different movements – the monetary reform movement, (including reforming the national currency and having a whole range of complementary currencies), the tax reform movement to move towards land and other resource taxes and away from income tax and sales tax, and thirdly the movement for a basic income, giving an unconditional, basic income to all people where paid work may not be available for all people. So – how do we do this? Well you can’t actually do one thing then do another and then do another because everything is interconnected. So we have to think about it as a whole system. A whole system hyperconnected globally. And we are saying that you have to look at the two things which change the system most, where you get the greatest “bang for your buck” by tweaking it just a little bit. We are saying you have to change the money system and the tax system. Those are the two paradigms we have to change. Secondly we have to change the goal of an economy. The goal of an economy is not just ‘to grow’, which is impossible on a finite planet and we all know that. And now we have got climate change because we have been so foolish. So pulling those three things together we decided we would end up leaving the current system alone. We have got a very bad tax system. Over 80% of our taxes are on labour, enterprise or sales. Nonsense! Those are things we want to encourage as long as the goods are the right sort for a post fossil fuel age. So that is a major change in our tax system. Secondly we want to change the money system. How on earth do you do that when we are so dependent on banks and banks are so powerful? So we are saying leave the current system alone. It is going to fall over, it is going to decay. It’s unstable, we have got deflation coming, huge debt. Goodness knows what is going to fall over next and what is going to trigger the next Global Financial Crisis. We are saying you have to start a second national currency in parallel. But this one is designed differently. It is spent into existence at local level to buy land, and then the revenue stream from the land rental (which is quite significant) will be passed to higher levels of government and occasionally it is shared with the all citizens over a year old through a Citizens Dividend. Right at the very start of this new currency we would pass a raft of new tax laws governing it. A full land tax, a full carbon tax and full mining tax. So it would be ruled by a different set of tax laws. And this new economy would grow in an entirely different way. It would be a thriving dynamic economy for a post fossil fuel age. Now we realise this is almost a preposterous proposal. And yet in Germany when they had a crisis in 1923 they set up a new national currency and it was backed by land. Ours is an improvement on theirs because we are putting it into existence without interest. It you allow the banks to create the money as interest bearing debt, then you are always going to have a growth imperative built in. It’s a mathematical certainty that you have to keep growing the money supply, and growing the economy and that causes a growth imperative leading to climate change. And we have to stop it. We have to design an economy not dependent on a growth imperative and that is for the sake of our children. So Germany successfully stalled their huge crisis in about a week. The farmers released their food for the towns and social unrest stopped. Now we went through several stages and you can see that on our site. We went through the stages of covenants on land, we went through various names for the new currency. But on this site you will see plenty to read. We ask you to join us in thinking and working to design a sustainable economic system. We are going to have a conference on the last two days in May and the first day of June in New Zealand and we invite you to come. More information on the website soon. So thank you very much and good luck!